Biscuit&#8217;s Valentine&#8217;s Day « Down with UP! This lovely app (available for Android devices) is interactive and ideal for your little one. Read along as this thoughtful little girl and her puppy, Biscuit, decide to show their loved ones how special they are on Valentine’s Day. They’ve got their work cut out for them, and lots of special deliveries to make. Biscuit is just a pup and still becomes pretty distracted by doggie treats along their journey. Read about their Valentine’s Day excursion and help Biscuit find treats along the way in this story for your Android device. With animations and sound effects on every page, this sweet story is fun for children of all ages. Biscuit has been a bestselling family classic for 15 years, with more than 16 million copies in print. 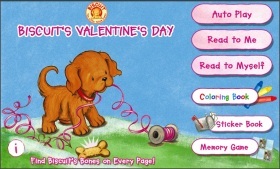 The Biscuit’s Valentine’s Day e-storybook includes three reading options suitable for all levels, coloring books, sticker books, and a matching game. Choose Auto Play, Read to Me, or Read to Myself. Auto Play reads the story and turns the pages–the best option for younger children. The Read to Me option reads the story while highlighting the words. Children with curious little fingers can touch the pictures and enjoy the animation, then turn the page when they’re ready. The Read to Myself option is best for beginner readers who want to do it all by themselves. After enjoying the heartwarming story, children can color pictures from the storybook, recreate the pages in the sticker book, or play a memory matching game with storybook cards. This loveable little girl and her puppy remind us all to show our special ones how special they are on Valentine’s Day.